On-time delivery of products (FR-112) is dependent on the reduction of variation in throughput time. Throughput time variation is largely a consequence of the degree of disruptions in the manufacturing system as well as how these disruptions are resolved. Disruptions as indicated by the MSDD are problems that lead to a loss in system availability. Quality problems, though disruptive to a manufacturing system, are treated separately under the previously described FR-111 “Manufacture products to target design specifications” branch and therefore the decomposition of DP-112 (Throughput time variation reduction) considers only disruptions that do not result from quality problems. Figure 1 shows the first level of decomposition of FR/DP-112. Figure 1 Decomposition of throughput time variation reduction. Decreasing the variation of delivery time to the customer requires a manufacturing system to have predictable output. With greater predictability, a company can make promises to its customers with the confidence and assurance that it can meet promised delivery times. When customers consistently receive products in the same amount of time from one order to the next, they are likely to gain confidence in the ability of the manufacturer to satisfy their orders. The result is a strengthened business relationship. The requirement to produce with a predictable time output reflects a manufacturing system’s ability to decrease variation in delivery time. Producing in a consistent and timely manner can be done when production resources are reliable and in themselves predictable. The resources that affect timely production are having sufficient material supply, adequate machine availability, and consistent labor productivity. 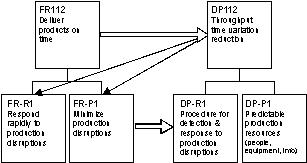 The ability to resolve production disruptions (DP-R1) is a prerequisite for minimizing production disruptions. Thus, the design matrix for the decomposition expresses a partially coupled design as shown in Figure 1.